Pistachio tree growing tree of the genus Pistacia and also known as Pistachio. 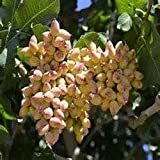 Pistachio tree perennial deciduous plant can grow in subtropical, mediterranean or desert (high elevation) climate and growing in hardiness zone 7-10a. Flower color red, there are female and male flowers, the female and the male flowers grow on separate trees. Nut color is green-brown, nutshell is yellow-brown and mostly open by it self, yield big crop once in two years. What can be done with big quantities of Pistachio tree nuts?